Posted on Friday, April 9th, 2010 at 11:25 am by Sergey Grischenko. 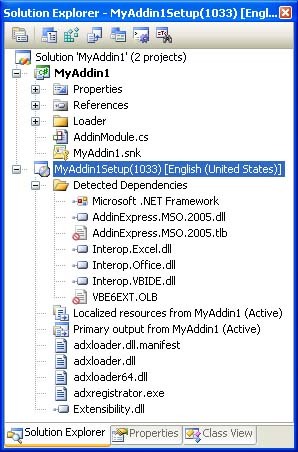 Add-in Express provides two basic strategies for deploying its projects: publishing an application via the ClickOnce technology, or deploying it with a traditional setup using the Windows Installer. In case of ClickOnce deployment, your application is published to some centralized location, e.g. a network share, and the user installs it from that location. 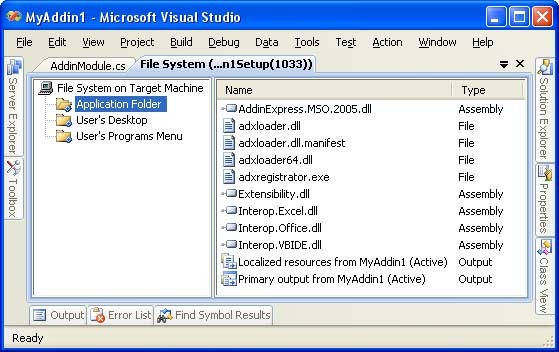 With Windows Installer deployment, you package the application in an .msi file and distribute that file together with setup.exe, which is used to install the application under the admin account. Under a non-admin user, it is sufficient to run the .msi file directly. Several factors should be kept in mind when choosing a deployment strategy: user permissions (administrator or standard user), the frequency and means of application updates, and installation requirements. Let’s consider the pros and cons of each strategy. In general, ClickOnce deployment works fine both for the end-user and the developer. The former gets quick and easy installation and updating while the latter makes less effort to tweak the installation. Add-in Express provides some methods for developers to make their ClickOnce applications self-updated. Though, this part of functionality should be implemented by the developer and depends on the application requirements. As for Windows Installer deployment, it offers greater flexibility and richer UI, a larger set of custom actions and powerful API. For the summary of all available deployment techniques – ClickOnce, Windows Installer and Add-in Express MSI-based Web deployment technologies, see the comparison table below. Security permissions granted Grants only permissions necessary for the application (deploying COM add-ins, it always requires Full Trust). Grants Full Trust by default. Grants Full Trust by default. With ClickOnce, rollback is available in Add/Remove Programs. ClickOnce deployment can access HKEY_LOCAL_MACHINE (HKLM) only with Full Trust permissions. As you see in the table above, there is just one difference between standard deployment via Windows Installer and our ClickTwice technology. It is the capability to automatically update applications developed for Microsoft Office and Internet Explorer with Add-in Express. Right click on the project item in the Solution explorer and choose 'Create Setup Project'. In the 'New Setup Project Wizard' dialog, fill in the 'Title', 'Project name', 'Description' and 'Company' fields (optional). Click the Next button. Now you can enter localization and location of your setup. Click Finish. A new setup project will be created. If it already exists in the output directory, you will be prompted to overwrite it. When the setup is ready, you will see something similar to the screenshot below. Also you can see some custom actions added to the Custom Actions editor. 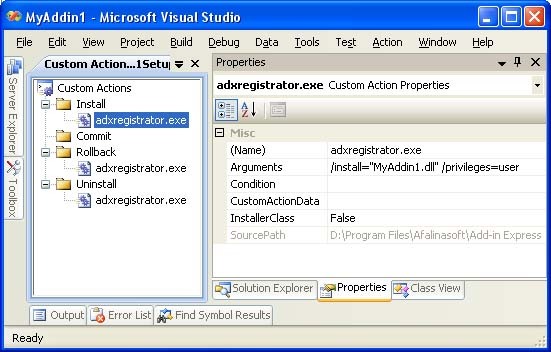 They run the adxregistrator.exe executable to register / unregister the application on the end-user’s PC. Now you can build the setup. The following warning may appear while the setup project is being built. The '/UAC' parameter determines if the UAC popup will appear in Vista or Windows 7 before the installation. That’s all for now. In the next part of this series we will have a close look at publishing the application. I have (almost)completed a Excel Add-in for sale and distribution. I am looking at your product to manage the command and context menus, as the final element of my project. Another main consideration is the deployment/licencing strategy. I need to control the “licencing” so the users pay for a subscription for a period of time (1 yr). I am considering using InstallShield for it as the install application as a result. How would Add-in express use Click Twice to accomplish this objective without combining it? with InstallShield? Is there a paper on your site that deals with this issue? Thank you for your interest in our product. ClickTwice doesn’t depend on any installers. All that you need is just to create an .msi database using any third party installer. Then ClickTwice will help you to deploy and update your project via web. Of course, the licensing strategy should be implemented by yourself. Now ClickTwice doesn’t support custom actions but this feature will be added in future releases of our products. How Can i supress “Norton” antivirus scan when they run setup.exe which is a “click twice” installer. You need to sign the installer with the valid digital signature. I am using click twice technology for addin setup, so i am just wondering how can i sign a setup using digital signature and where to get it from. Is there any 3rd party digital signature providers or any other way out? To sign your installer with the digital signature you need to use the valid certificate (‘.pfx’ file) in the ‘Certificate File’ field of the Publish wizard. Will the digital signature bought from symantec supress all antiviruses alerts or specifically “Norton” antivirus. Please provide information regarding this. The digital signature will not suppress anything. Antivirus software will scan your installer silently without the alert.